Submitted by Marthapb@hotmail.com on Sun, 02/06/2011 - 09:19. 1 cup of milk, scalded to luke warm. and wait until bubbles form). 7 1/2 cups all purpose flour(variable). (King Arthur). I have used my Kitchen Aid Mixer for many years with very good results or you can thoroughly mix and knead all ingredients by hand until smooth. Place in large bowl, cover with plastic wrap and rest over night in the fridge. (I started doing this so it wouldn't rise out of the bowl). Next morning knead; then let rise in warm room until doubled in bulk. Roll out, cut with doughnut cutter, place on cookie sheets or large trays and proof while getting the frying fat heated. - Crisco is the fat of choice for frying-last year I tried vegetable oil and they weren't as good. - I have reserved an electric frying pan just for doughnut making. - Fry in deep fat turning once (use handles of two wooden spoons to good effect), until brown. - Drain on paper towels placed over several thicknesses of newspaper. - Cool about 5 minutes before shaking in a bag with cinnamon sugar. 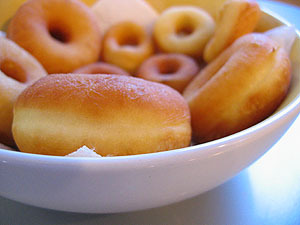 I only use part of the sugar at a time or it gets damp from steam from the warm doughnuts and doesn't cling as well. Prepare cinnamon sugar by mixing about a teaspoon and a half of cinnamon in one cup of sugar.